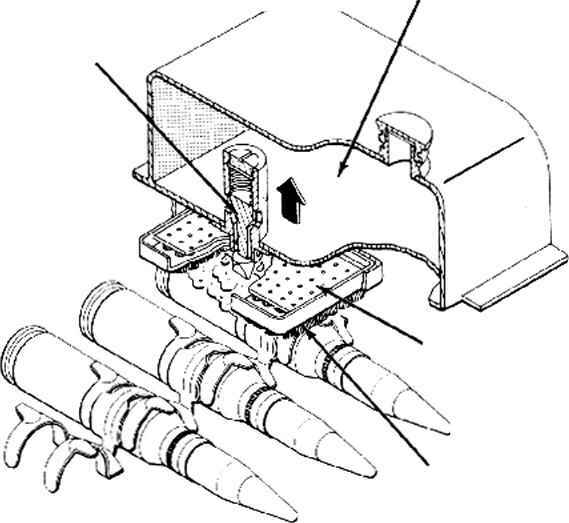 86th partial report on functioning and mechanical test of machine guns and machine gun accessories and 1st partial report on test of Hispano-Suiza 20 mm automatic cannon, type 404, Birkigt patents. 1938. Illustrated. Tested Jun 21 to Aug 5, 1938. 20-mm automatic guns and materiel: Record of Army Ordnance research and development. Dec 1945. Foreign Ordnance Receiving Depot, Naval Powder Factory, Indian Head " Preliminary report on Gun, Machine, aircraft, 20 mm Hispano-Suiza—Italian. 1945. Almost identical with U. S. AN-M2 cannon. Illustrated. Canons automatiques de DCA., armement de bord pour avions, marine, etc., armes automatiques d'infanterie, muni-tions. Geneva, n. d.
Photographs and descriptions (In English) of Type 804 H-S AA cannon 20 mm, Type 626 mounting for AA cannon, magazine type 804 (drum type), triple mounting type 630-3, type 804 aircraft cannon, belt feed mechanism, twin magazine type 504, type 830 30 mm AA cannon, firing tests and ammunition. Many photos. Canons automatiques de DCxA., armement de bord pour avions, marine, etc., armes automatiques d'infanterie, munitions. Geneva. Hispano-Suiza (Suisse) S. A., Geneva 30 mm automatic gun, type HSS 825. Manual on aircraft gun which can be equipped with a 30 or 20 mm barrel and will function for either caliber without alteration. Rate of fire 1000 rpm. Photos and diagrams. 20 and 30 mm cannons for A A and infantry. Types HSS 804 and 831. 1953. Description and illustrations of subject cannon. Contains description of origin of Hispano-Suiza name. Notice sommaire sur le canon Hispano-Suiza type 404. 1937. Gun, automatic, 20 mm, Ml and M2. (U. S. Army Specification No. 51-12-48A, 5 Jan 1942) With Amendment 4, 31 Jan 1944. Compilation of latest techniques and procedures as determined through service usage for maintenance of M3 (Hispano) under all weather conditions. Illustrated. A review of the status of the subject gun and accessories as of 3 Nov 1941. Covers feeds, trigger controls, chargers, etc. 20 mm M-2 automatic guns, technical data on. Memorandum dated 4 Jun 1942. Includes technical data based on GM (Oldsmobile Div.) engineering records, problems encountered in servicing the M-2 automatic guns, and 4 failure reports. List of all parts of gun, automatic, 20 mm, AN-M2 and M3. Jan 1948. Alphabetical list of all parts required to make a complete weapon. Exploded views are included. At time 20 mm Hispano-Suiza cannon had not shown superiority in effectiveness over Browning .303 machine guns. B. M. A. R. C. 15 nun and 30 mm aircraft guns. 19 Mar 1945. Data on two guns being sent to Aberdeen for testing. Modifications of Hispano-Suiza gun by British Manufacture and Research Co., Ltd. (BMARC). Unfavorably reported on by RAF due to their weight and failure to live up to specifications. Firm has made 3 high-speed films showing action on Molins modified Mark II aircraft gun. Report describes contents of films. Fires 1050 rounds per minute. Supplement to MA 56096, giving further details on modifications to Hispano-Suiza 20 mm gun. Certain parts need strengthening to prevent recurrent stoppages, particularly locking plate and breech block. Relates to redesign of 20 mm Mark II gun to increase rate of fire. Modifications should be considered in connection with U. S. gun. Gives detailed characteristics of Hispano 20 mm gun. Also data on procurement by Great Britain. Specific details are given for wing mounting of Type 404 Hispano in single-seater fighter Blocti 150/151. Gives characteristics of 23-mm cannon then under development. Mentions 30-mm cannon but no details available. LT. S. Naval Proving Ground, Dahlgrcn, Va.
Report of firing tests of Hispano-Suiza-Birkigt 20 mm aircraft cannon, type 404. No. 10868. Dahlgren, Jun 3, 1941. Illustrated. Tests held Jul 1940. U. S. Naval Proving Ground, Dahlgren, Va. 20 mm automatic gun, T34. 15 Jun 1945. Report on tests for comparison of T31 (M3) and T34 guns for service use. Data on cyclic rates, malfunctioning, and breakage. Parts breakage excessively high; extraction failures; failure of driving springs. Tables and photos. U. S. Naval Proving Ground, Dahlgren.. Va.
20 mm automatic gun T34—Ground testing, partial report. 6 Oct 1947. 2 T34 guns tested from Feb to Sep 1947 for functional characteristics, including cyclic rates of fire, recoil travel, dispersion on rigid and non-rigid mounts, muzzle velocities and parts life. Tabulations, graphs, photos. U. S. Naval Proving Ground, Dahlgren, Va.
20 mm automatic gun T3l (M3)—modified. 9 Aug 1945. Results of tests on modified gun for rate of fire, recoil and endurance. Modifications include changes in gas cylinder sleeve and vent, plug orifice ; also Chinn type muzzle booster. Unreliable performance and excessive parts breakage. U. S. Naval Supply Depot, Mechanicsburg, Pa.
20 mm gun modifications, additional clarification of. 28 Jan 1944. Lists modifications by part number, nature and revision number. Discusses British request for modification of chamber of gun to conform to British chamber which is 2 mm shorter. Recommends that no change be made in American gun and that guns made in IJ. S. for British use he tested as is before decision to make them with British chamber. Gun, automatic, 20 mm, Ml and M2. Base shop data. Rock Island Arsenal, 1943. Contents: Dismantling; magazine; receiver; tube; assembly. Illustrations and diagrams. Contains instructions required for identification, use, care, inspection, maintenance and rebuild of M3 gun and of equipment used therewith. (Combination blowback and gas-operated aircraft weapon.) Drawings and diagrams of weapon and components.